It’s time for a new year – amazing! December was really unique this year. Here’s a recap. 1) Went on a week-long Carribbean cruise on Princess Cruise Lines and had a great time. Did so many fun and physically active activities (Zumba, line dancing classes, stand-up paddleboarding) that I had to go back to work to sit and rest! 2) Spent a lot of time preparing for Christmas — although my family celebration is being postponed this year, so we can all be together. Our Christmas will be Jan. 2! Guess that technically means we’ll have two Christmases in 2015. 3) Got Christmas cards and notes from old friends and heard what some of them are up to. That’s always nice. 4) Enjoyed sharing Christmas thoughts and memories on my blog — because I’m really a big Christmas person! Love the shopping, the lights, the cards, the decorations, the music, the whole experience. Except wrapping presents. 5) Joined a group of people for Dragon Boating on the Ashley River on a Saturday morning. It was invigorating and fun! That’s been on my “to try” list all year. A blog post about it is coming soon. Didn’t have Christmas this month! But I got through it with a lot of phone calls — and later this week when everyone else is back to work and the dreary part of the year starts, I’ll be celebrating the holiday, opening presents and surrounded by my loved ones. 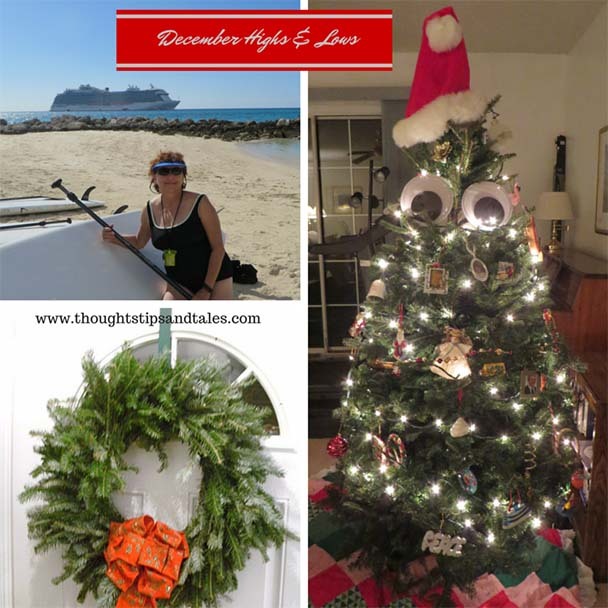 This entry was posted in Christmas, cruising solo, December and tagged Christmas, cruise, December. Bookmark the permalink.